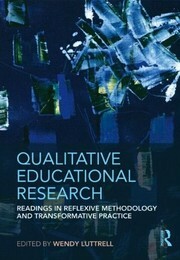 Qualitative Educational Research is a comprehensive anthology designed to deepen education students’ thinking about their qualitative research purposes, questions, and decision-making. Focusing on various epistemological, intellectual, and ethical conflicts in doing social analysis, thisreader invites researchers-in-training to explore why, from what perspective, for whose benefit, and with what stakes are research questions being posed. Drawing from her wealth of expertise executing and teaching qualitative research methods, scholar Wendy Luttrell has selected essays that focus specifically on the challenges of qualitative inquiry as they pertain to the field of education. These essays present multiple paradigms and perspectives in qualitative inquiry, including interpretivism, critical theory, cultural studies, feminist theories, critical psychology, and critical race theory. Reflexive writing assignments at the end of the volume expand readers’ understanding of the essays and guide students through developing their own research design. 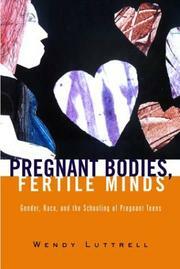 In Pregnant Bodies, Fertile Minds Luttrell focuses on fifty girls enrolled in a model public school program for pregnant teens, Luttrell explores how pregnant girls experience society’s view of them and also considers how these girls view themselves and the choices they’ve made. She pays particular attention to how schools react to pregnant teens and what they are doing to help these vulnerable young women to achieve their education. Readers learn the real problems that pregnant teens are dealing with, and how society’s racial and class stereotypes continue to stigmatize and scapegoat them. These individual stories are accompanied by personal self-portraits that present a carefully detailed and powerfully moving picture of the issues these girls face everyday. School-smart and Mother-wise illustrates how and why American education disadvantages working-class women when they are children and adults. In it we hear working-class women–black and white, rural and urban, southern and northern–recount their childhood experiences, describing the circumstances that led them to drop out of school. Now enrolled in adult education programs, they seek more than a diploma: respect, recognition, and a public identity. Drawing upon the life stories of these women, Wendy Luttrell sensitively describes and analyzes the politics and psychodynamics that shape working-class life, schooling, and identity. 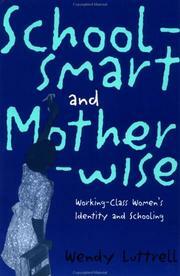 She examines the paradox of women’s education, particularly the relationship between schooling and mothering, and offers practical suggestions for school reform. Luttrell, W. (September 1, 2012). Making boys’ careworlds visible. Thymos: Journal of Boyhood Studies, 6, 2, 186-202. Luttrell, W., Restler, V., & Fontaine, C. (2012). Youth video-making: Selves and identities in dialogue. In Milne, E. J., Mitchell, C., & de Lange, N., Eds., Participatory Video Handbook. Latham, MD: AltaMira Press. Luttrell, W. & Dodson, L. (Winter 2011). Families facing untenable choices. Contexts, 10, 1, 38-42. Luttrell, W., Dorsey, J., Shalaby, C. & Hayden, J. (2011). Transnational childhoods and youth media: Seeing with and learning from one immigrant child’s visual narrative. In International perspectives on youth media: Cultures of production and education, edited by J. Fisherkeller. New York: Peter Lang. Lico, S. & Luttrell, W. (Winter 2011). An important part of me: A dialogue about difference. Harvard Educational Review, 81, 4, 667-686. Luttrell, W. (January 1, 2010). ‘A camera is a big responsibility’: A lens for analysing children’s visual voices. Visual Studies, 25, 3, 224-237. Luttrell, W., Holland, J.C. & Ward, J. (2006). “Nice kids,” the N word, and signs of respect: Culturally relevant knowledge of urban youth.” In Addressing racism: Facilitating cultural competence in mental health and educational settings, edited by M. Constantine and D. W. Sue.